With the images leaked a couple of weeks ago, Pentax officially presents its K-S1, a monocular digital reflex which most differentiating characteristic rests on the “luminous” style of its user interface. That does not mean that technologically, the K-S1 is not advanced; it actually incorporates “the best” of the Pentax actual series in APS-C format, but it is true also that the design has been done – it is said – “In collaboration and under the supervision for design and color by the Tokio branch of Zyba Tokyo, Co., Ltd of the Zyba design company with its headquarters in Portland, Oregon, U.S.A”…. An in general, we already know what happens when, in the photographic sector, the great designers get in between. Well… this is not only about the color combination, which are twelve colors of which we will talk later on, but also of a LED illumination system with color codes, directed not only towards the user (The photographer) but also the people photographed… yes. In the Pentax K-S1, the switch on / off, the mode dial, the “OK” button and the front side of the handle have LEDs that indicate the operation status, and not always with the same color: The color depends on the status of the operation. This way, for example, the on/off commuter LED will be illuminated in green while we shoot, but it can pass to red if we are recording videos. It seems that the decision to offer this user interface and the color combinations has been taken so as to offer “an attractive product to smartphone and tablet users that take photos with them and look for better image quality”. The first- out of four variants – tries to recreate colors and shade of tissue such as cotton (beige), tweed (gray), denim (blue jeans) or linen (brown), while the five variations of the second try to express the sky transitions from dusk to dawn, with suggestive names such as Sunset Orange, Dusk Gold, Moon Silver, Midnight Black, Dawn purple. The Pentax K-S1 forms stand apart from the traditional “K” line, and the body obeys a very compact and individual design, but that has to maintain the flange distance, which makes it a Little bit chubby for us. But it depends on people’s tastes. Let’s not forget : we are not talking about a Christmas tree decoration, but about a real full blown reflex, with an optic glass pentaprism with 100% coverage (approximately) and equipped with a 20.12 Mpx CMOS APS-C sensor of the newest generation, (up to 51,200 ISO) free of low pass filter (AA), but with the optional emulation of one, and adjustment to user’s level. The back screen has 921,000 points and uses an improved typography for grater legibility. In fact, the system operates in reality in collaboration with the SR system of camera stabilization by sensor displacement: Micro vibrations are applied in sub pixel scale to emulate the system of an AA filter (let’s remember it is optional). The shutter reaches 1/6,000 seconds, and thanks the advanced AF is supposed to the SAFOX IX+ module with 11 sensors including nine of them in cross configuration in the central section. It seems, they have worked hard to improve the performance of the AF for tracking users in movement, especially with lenses. The measurement is for 77 zones and the dust prevention system functions through vibrations of the SR system. The PRIME MII processor is partly responsible for this fast AF, but also of a high error, vignetting and diffraction correction capacity on all the coupled Pentax lenses series, which are compatible with the new Pentax K-S1. 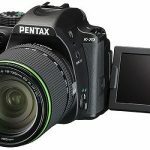 Talking about video, the Pentax K-S1 offers Full HD at 30/25/24 p and in H.264 format. Previous Kipon launches nine macro adapters for mount Fuji X.